A letter from the World Theravada Buddhist Sangha Council (WTBSC) to H.E. General Prayuth Chan-O-Cha implores him to find peaceful means to halt the human rights violations of the Department of Special Investigation (DSI) on Phrathepyanmahamuni (Most Venerable Dhammajayo). Venerable Pasura Dantamano, Chief of International Affairs Division at Wat Phra Dhammakaya, indicated that the World Theravada Buddhist Sangha Council has filed a letter via email with the Prime Minister General Prayut Chan-O-Cha requesting that he find a peaceful resolution. At the present moment, Wat Phra Dhammakaya is in a delicate position that warrants grave concern for its abbot, who is defamed and being unjustly charged by Thailand’s (DSI). Since the lawsuit lacks solid evidence, the World Theravada Buddhist Sangha Council fears that he is being unfairly persecuted. DSI has violated many laws, including issuing an arrest warrant based on the mere reason that Ven. Dhammajayo did not meet with DSI officials as requested. This is in spite the temple’s plea for DSI to present the abbot with his charges at the temple due to illness that had been verified by a panel of doctors. The temple confirms they submitted this request to DSI repeatedly so that they could send their panel of medical specialists to verify Ven. Dhammajayo’s health condition at Wat Phra Dhammakaya. What is suspicious is DSI has refused to respond to their plea and insists on issuing an arrest warrant, which is considered a clear violation of patient rights. DSI has indicated that it will enlist the help of 2,200 troops in order to arrest the ailing 72-year old monk. Ven. Dhammajayo has dedicated his entire life to fostering world peace and disseminating Buddhism. The attitude and actions of DSI are short of justice and beyond what is necessary. This creates tremendous doubts and uncertainty for other organizations working toward peace and morality. WTBSC, thus, requests H.E. General Prayuth Chan-O-Cha, Prime Minister of Thailand, to review this matter and generate a peaceful solution to end all violations by DSI on Wat Phra Dhammakaya. WTBSC firmly believes H.E. will understand the sensitivity of the situation and will move forward in a manner most appropriate and most compassionately towards this Buddhist monk. Security measures around Wat Phra Dhammakaya have been set up. Venerable Noppon Punyachayo, Deputy Director of Communications, admitted there has been just cause for the increased security measures that included installing barbed-wire onto the temple’s external walls and other areas, and increased numbers of CCTV to monitor people entering and exiting the temple. However, Venerable Noppon affirms that there has been no use of force and that the temple remains positive. There is concern and precaution against third parties who may cause unnecessary problems. 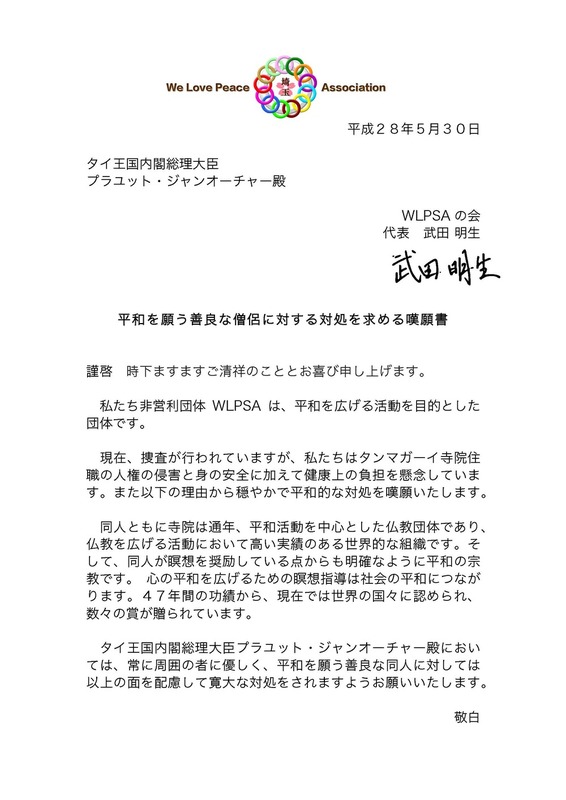 Additionally, letters from other organizations located in Korea and Japan have been sent to ask the Prime Minister to intervene in the case including the Theravada Sangha Senate of Korea; We Love Peace Association of Saitama, Japan; and the Thai-Japanese Relations Association of Tokyo, Japan, amongst others.